STRASBOURG, France, June 8, 2011 (ENS) – EU Member States will soon be able to charge trucking companies for air and noise pollution costs in addition to motorway tolls as Eurovignette road haulage tax rules are being revised. A directive approved by the European Parliament on Tuesday will ensure that revenue from these charges is used to improve the performance of transport systems and cut pollution. On average, three to four euro cents per vehicle/km may be added to charges for using transport infrastructure to cover the external costs of road haulage, starting with air and noise pollution. The directive will cover not only trans-European transport networks, but all motorways, and will apply to all vehicles of over 3.5 tonnes. If a Member State wishes to grant exemptions for vehicles of up to 12 tonnes, then it must notify the European Commission of the reasons why. In exchange, Member States firmly commit themselves to invest 15 percent of overall revenue in trans-European transport (TEN-T) networks. The remaining amounts should be used to reduce damage to the environment and develop all transport systems sustainably, the MEPs said. To promote transparency and public debate, MEPs inserted into the law a requirement that Member States report regularly to the Commission on the charges imposed and the use made of revenue from them. 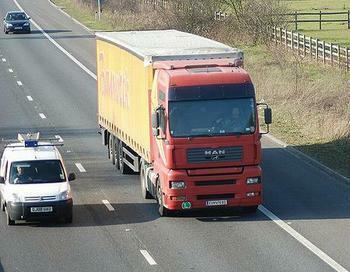 Trucks with the least-polluting engines will be exempt from air pollution charges until January 1, 2014 for the EURO V emission class, and until January 1, 2018 for EURO VI. In sensitive and mountainous regions, the existing “mark-up” of up to 25 percent may continue to apply and may be added to the external costs charged for lorries in the heaviest pollution classes, EURO 0 to II. The markup also may be extended to the EURO III class from January 1, 2015. To manage traffic flows more effectively without generating more revenue, charges may be varied by up to 175 percent in congested areas, with the highest charges applying during five rush hours, and lower rates at all other times. “They also give Member States new tools to fight congestion with possibilities to vary charges at different times of the day to get heavy lorries off the roads at peak periods,” he said. About 30,000 km of motorways are currently tolled in Europe. About half of these are in the TEN-T network and so fall under the scope of the Eurovignette Directive. Under the revised Directive, which extends the scope of the old law, all of Europe’s 30,000 km of tolled motorway will be covered. To enable hauliers to calculate their costs and plan routes, the European Commission will make available a list of charges and the times whey they apply throughout the EU. The new Eurovignette rules, approved with 505 votes in favor, 141 against and 17 abstentions, still must be formally approved by the EU Member States.